"After launching our independent practice, we have grown from $19 million to $700 million in assets under management"
SAN FRANCISCO--(BUSINESS WIRE)--Schwab Advisor Services today announced the launch of a new phase of its national advertising campaign that tells the success stories of independent advisors. 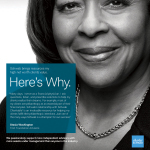 The new campaign features advisors from a diverse array of firms sharing stories of their firms’ growth and evolution against the backdrop of their relationship with Schwab. The campaign debuted this month in print media and on digital properties, along with a complementing component of thought leadership material, case studies, and actionable resources for advisors who are considering independence. The new phase of the campaign builds on Schwab’s “My Independence Day” ads, which launched in 2014, by continuing to celebrate independent advisors and their personal success stories. The new campaign explores considerations and opportunities associated with going independent and shows how Schwab supports advisors as they make the transition and ultimately build enduring businesses. Schwab Advisor Services also continues the national campaign it launched last year to advocate directly for independent advisors and raise awareness of the benefits of independent advice among high-net-worth investors. The campaign includes print and digital media as well as an Independent Advisor Learning Center that allows investors to learn more about the independent advice model and connect directly with independent advisors in their region through a mobile-enhanced directory. 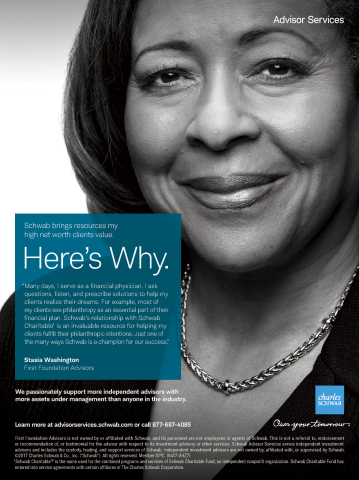 To learn more about the campaign, visit advisorservices.schwab.com.